There are multiple ways to close email messages. First you must choose your closing word or phrase, if you wish to include one — for example, Thank you or Regards. If you know your recipient and are addressing him or her by first name, in most cases you can then add just your first name. If you are writing more formally and are addressing the recipient by last name, it is usually preferable to close your email with your full name. Figure 3 shows a closing, accompanied by the signature file (which is covered in detail in the next section), for an email from a person who knows his recipient fairly well. 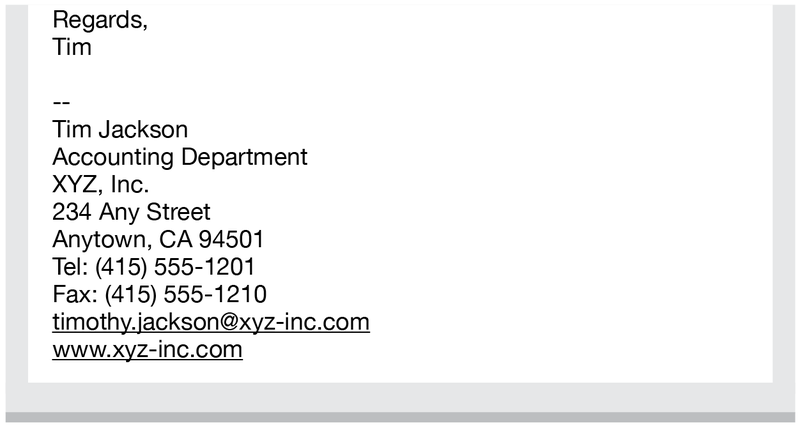 In Figures 3 and 4, the font used in the email body is the same as the signature file font. 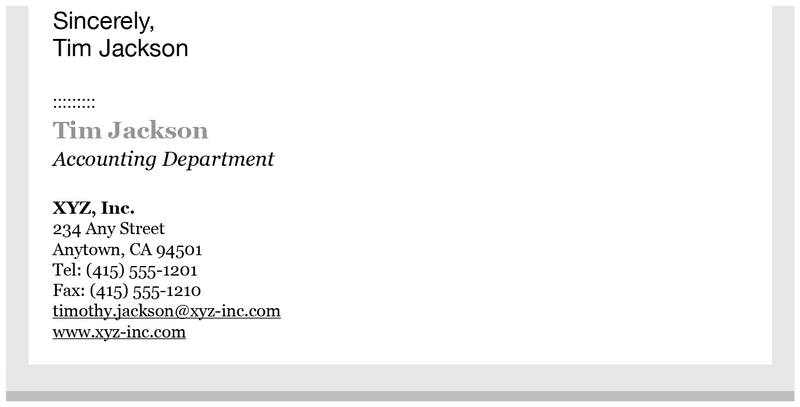 If, however, your signature file has been specially formatted (preferably by your art department or a professional designer) so that its appearance is distinct from the rest of the text in the body of your message, you should in a formal email repeat your full name after your closing, as shown in Figure 5. Otherwise it may seem as though you didn’t bother to “sign” your email. Some businesspeople put periods after their names in closings. If you feel the temptation to do so, resist it. In more casual emails, it may be fine to sign off without a closing phrase and just put your name. As a general rule, though, don’t sign off with just your initials. If you use initials, you risk irritating recipients who may view this shorthand as a sign that they are not worth the time it would take to write your actual name. (Remember a cardinal rule of emailing: people who are bothered by your habits won’t necessarily tell you how they feel.) Some people don’t care, of course, and if you use email shorthand with your long-time colleague who sits two desks away, that may be fine.